EUR/USD dropped from the highs following the upbeat US GDP report. Is it ready to rise? Significant support awaits the pair, opening the door to the upside. 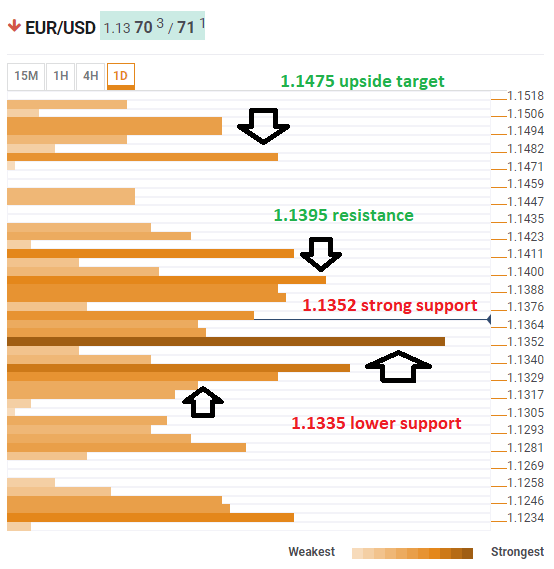 The Technical Confluences Indicator shows that euro/dollar enjoys significant support at 1.1352where we see a dense cluster including the Simple Moving Average 10-one-day, the Bollinger Band 4h-Lower, the BB 1d-Middle, the Fibonacci 23.6% one-week, the BB 1h-Lower, the SMA 200-1h, and the SMA 50-4h. A bit lower, EUR/USD enjoys another support line: at 1.1335 we see the confluence of the Fibonacci 38.2% one-month, and the Fibonacci 38.2% one-week. Resistance awaits the pair at 1.1395 which is the convergence of the SMA 100-1d and the Fibonacci 61.8% one-month. 1.1475 is the upside target where we see the meeting point of the Pivot Point one-day Resistance 3 and the PP one-week Resistance 3.